Founded in 1968, Precision Made Cartridges (PMC) is now one of the world’s largest ammunition manufacturers. 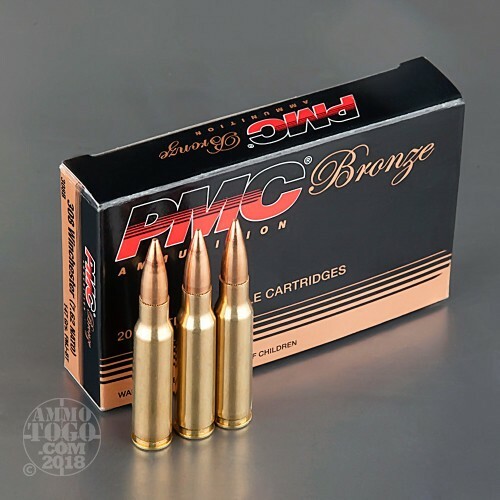 Based in South Korea, PMC manufactures all their own ammo components from quality raw materials. This process gives the company total control over every step of the supply chain. PMC even punches cases from brass rolls they manufactured themselves. 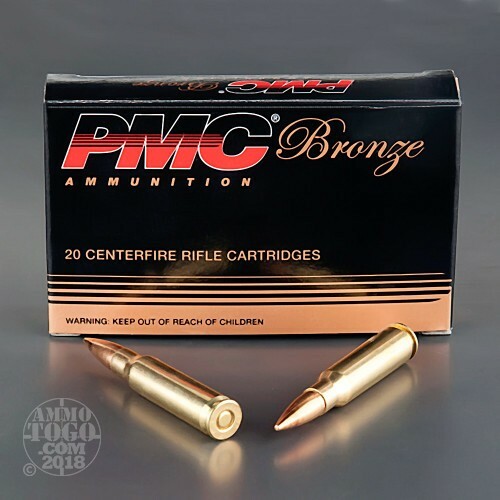 Perfect for the high volume shooter, this package contains 500 rounds of PMC Bronze .308 Winchester ammunition. Each cartridge is loaded with a 147 grain full metal jacket boat tail projectile. Delivering minimal terminal expansion and incredible long range accuracy, this is premium target ammunition with a highly affordable price tag. This new production ammunition is 100 percent non-corrosive, boxer primed, and features fully reloadable brass cases. 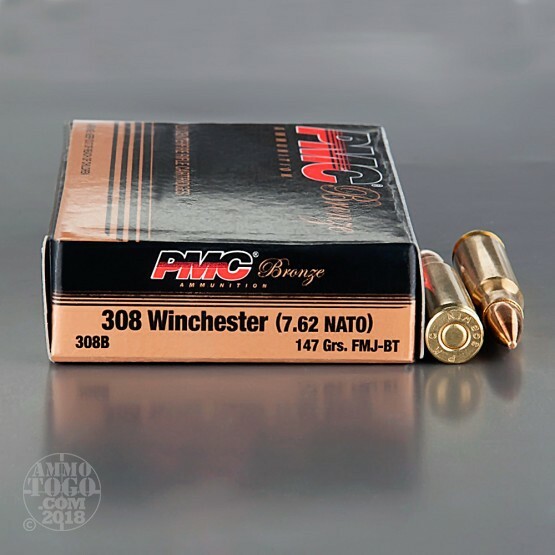 Packed in 20-round boxes, this ammunition produces a consistent muzzle velocity of 2780 feet per second and a muzzle energy of 2522 foot pounds. Great ammo- Great service. Fast shipping! Certainly will buy from Ammo to Go! N problems with ammo: feeds and fires and ejects without issues. Functions flawlessly. Good reloadable brass. Decent prices considering todays "ammo-flation" prices. Purchased before Calif ammo ban on mail order ammo kicks in on 1-1-17... Remember to VOTE! Great service, great price. I have been buying this ammo for awhile with great results. posted on 2/24/16 by Steve J.
Im giving this rating on customer service and delivery. No Issues I ordered 500 rounds arrived within prescribed time. I have not shot this ammo yet. 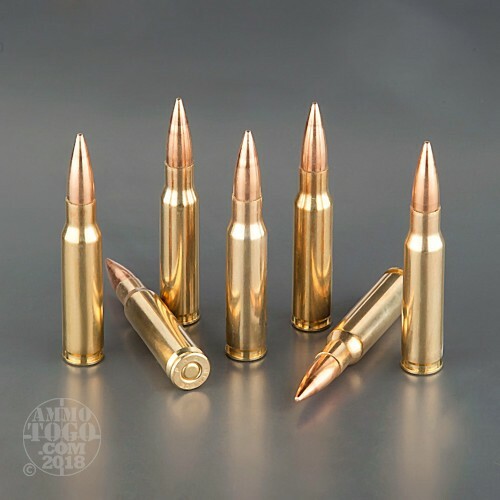 Best ammo for the money you can buy, and then you have plenty of brass for those super accurate custom loads after practicing with these. Great price ordered it yesterday showed up this morning you can't beat that kind of service. ruger American rifle no problems. Its good for about 650 yards but then it shot group goes from 3 inch to 5-6 at 750yrds and really goes wild beyond 900 yards. Its a goods price but for serious long shooting I am going to stay with reloads. Nice ammo. Nice price. Shoots well and has good appearance. No problems with this ammo in my PA-10. Good price. Will buy again. This stuff is a good price and good ammo i will have to get more soon.